You came to Bali with your family. You have already relaxed, got a tan and swim enough. What else to do besides lying the entire vacation on the beach? Here is a list of interesting and exciting places that will like not only children but also adults. The picturesque Marin Safari Park covers an area of more than 40 hectares. Wild and semi-wild animals of Indonesia, India and Africa live here in natural conditions. There are 400 species of various mammals, fishes and birds: from elephants and tigers to toucans and Komodo dragons. 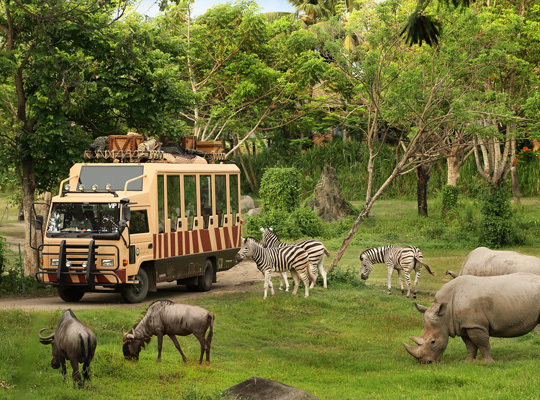 The transportation during safari is on a specially equipped vehicle: tourists are transported in glass closed or with grid trams and cars. The duration of the ride through the natural habitat of animals is about an hour. Besides the informative part of the trip (the Park's stuff tells inspiringly and in detail about rare species of birds and mammals), there is also some entertainment in the Park. There are organized elephant shows, tiger feeding and animal shows at fixed times. Children will be able ride an elephant, feed predators (even piranhas!) and take a free photo. Near the Park there is an entertainment area and a cafe. If hungry go to a nearby restaurant (various cuisines are offered). Here through a huge and safe glass you can watch the lions get fed. Attractions are made with the latest technology. The choice is quite good: rafting on a boat on an artificial river, driving cars like on a real highway or riding a water slide. In the center of the Park there is a local theater that accommodates more than 1,000 people. Shows with dancers and animals are held daily. There is also a puppet theater. Safari Park is open from 9 to 17. If you have not purchased tickets in advance, it is recommended to come to the opening hour, so as not to stand in queues. Please take into consideration that you are going to spend at least three hours in the Park. If children are small, it is better not overburden them, choose a tour guided by needs (check whether there is a water Park in the program and animal shows). The romantic name of the boat (by the way, there are only two such boats in the world) refers to literature sources from Homer's 'Odyssey' to 'Underwater Odyssey' by Jacques Yves Cousteau. Diving into the underwater world is not the same thing as observing the life of inhabitants of deep sea on the screen - the feeling is completely different! The submarine can accommodate 36 people and is therefore spacious and comfortable with air conditioning. Soothing music, entourage and proper lighting makes it possible to feel in the right atmosphere. The boat is safe, the elderly and children can also dive. Instructors will brief you on and give life jackets for your safety. If you have a curious child, take a seat closer to the ship's bow: you will see better the underwater world and also the dashboard with the captain in action. The submarine dives to 25 meters depth, and the observing the inhabitants of the sea will take about an hour: you will see reefs, flocks of fish and even their feeding – professional divers will feed fish for you. After diving you can take a photo. Even though the duration of the underwater tour is not very long, most likely you will spend the whole day for it: you need time to get to Odyssey; however, the way to it is also interesting – while riding on a boat, you will be able to see the whole arsenal of marine equipment. Discover a world full of adventure on a submarine! Surfing with kids? Is it possible? Yes! Nowadays parent's lifestyle undergo some changes. When taking children to remote destinations, you do not think that you have ruined your vacation, then you should definitely try surfing with kids. Bali is the best place to try this sport: perfect waves in the ocean, and the water is constantly warm about +26 +28 degrees. 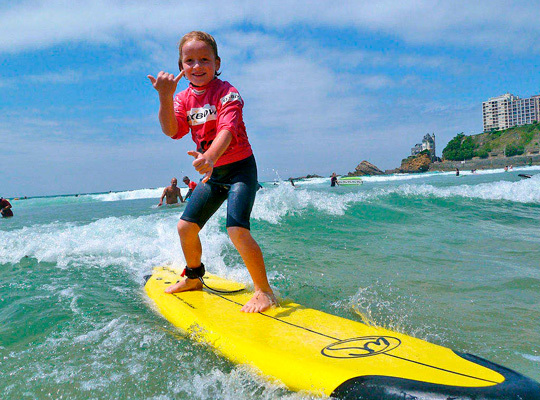 Children can start learning surfing from the ages 5-6, but the most optimal age is 8. At this age parents should be with their children: their example will work better than words. 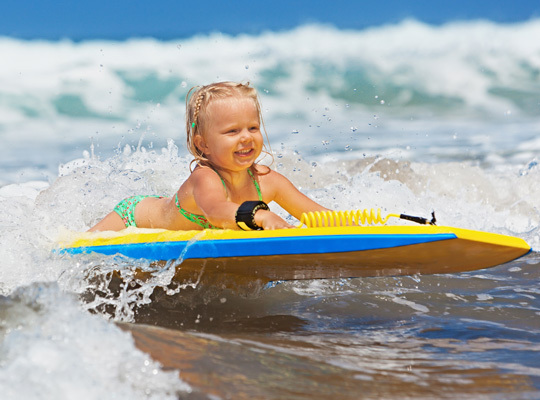 According to instructors there is almost no difference between boys and girls in terms of learning to surf, although boys sometimes due to their natural activity learn a little faster than girls. It is important that a child is not afraid of water, and it will be better if he or she already knows how to swim and dive. Children over the age of 14 are taught in adult groups. In Bali there are a many surf schools with Russian-speaking instructors who will help you and your child to conquer the waves on surfboard. Training consists of several lessons, where each lesson includes theory and practice. First lessons for beginners are usually taught in the pool. If you are a fan of outdoor activities or you are tired of tanning on the beach, explore the Balinese sights on a bike. 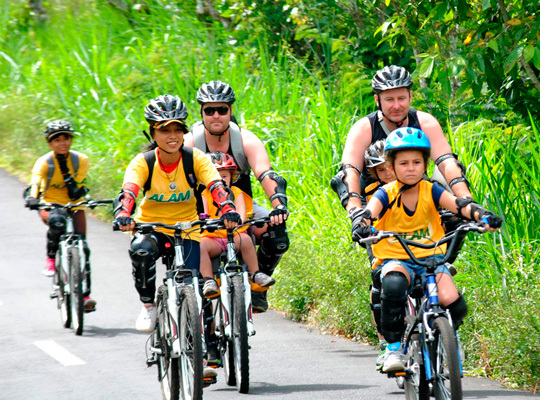 In Bali it is possible to rent a bike or go for a bicycle tour, where everything is already planned and organized. By the way, if you use the services of tour operators, you can not worry about safety: high-quality bicycles, equipment and clothing are included in the program. Food and shower to freshen up after the ride are also included. Depending on child's age a kids bikes or a child seat are at disposal. Traditional attractions: Balinese village, the life of which is better to explore not from the car window, but when riding a bike. To see how rice is harvested, how it grows on special fields will also be more interesting in such trip. Tropical jungle will add adventure to your trip. 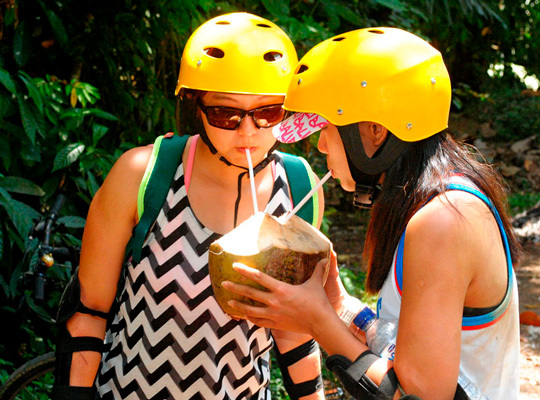 And if you get thirsty, coconuts will hit the spot. You have seen all Bali sights? 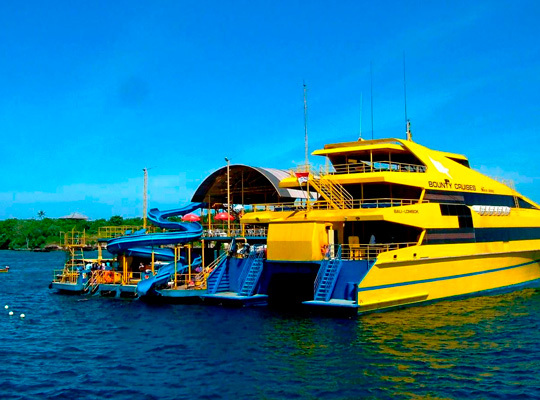 Go to Lembongan island, which is located nearby and can be reached on Bounty cruise yacht. Lembongan impresses with its dense greenery and almost untouched natural beauty. And, of course, with its beaches. The yacht moores to the floating pontoon. Water rides on it will excite any child. 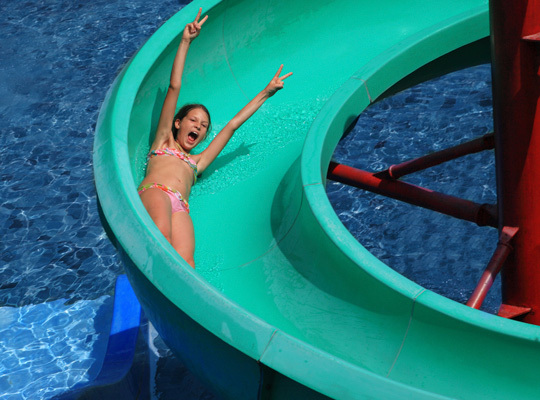 There is a large 44-meter water slide. Among fun activities there is boat riding with glass bottom (the water is turquoise and super clear: you will see fish flocks swimming under the boat), banana ride and canyoning. Try snorkeling near the beach. Island's climate is drier and hotter than in Bali, so children will enjoy swimming in the water almost all day. If you get tired of swimming, go to a local village to see the life of inhabitants. Local people are friendly and welcoming, kind to kids. The main occupation of these people besides tourism is seaweed cultivation. Restaurants and cafes are located right on the beach. Take here a refreshing drink. The cruise will take a whole day, so prepare everything for swimming and tanning. Do not forget to swim in the ocean and sunbath, wander through the jungle, plant rice and go to famous Ubud. 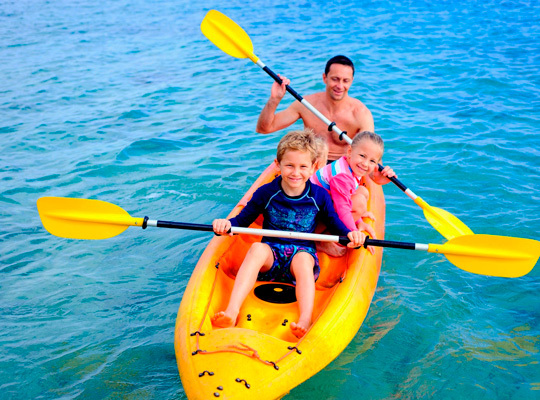 Enjoy the holiday with your family and leave it to professionals to organize an unforgettable vacation of your life!